Jump is a joint supplement that contains glucosamine and helps dogs maintain joint flexibility and mobility. Great for young, active dogs! 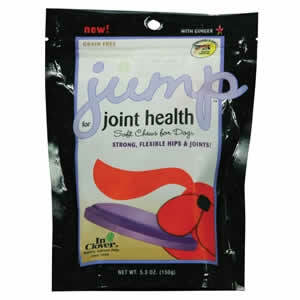 Jump is a joint supplement that promotes strong, flexible hips and joints in young, active dogs. 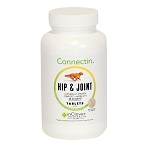 Jump contains balanced amounts of glucosamine, MSM, fish oil, coconut oil and natural herbs to support healthy joint development and flexibility and also encourage vitality. Great tasting chews that dogs love! Carries the National Animal Supplements Council quality seal. 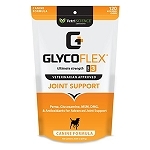 Glucosamine HCl - 500 mg.
Glucosamine helps to restore cartilage and improve joint functioning. Methylsulfonylmethane (MSM) - 400 mg. The sulfur in MSM can be utilized by the body in the formation of compounds such as glucosamine and chondroitin sulfate, as well as the amino acids methionine and cysteine. Fish Oil - 135 mg.
Ginger Powder - 90 mg.
Yucca Extract - 50 mg.
Alfalfa Extract - 50 mg.
Cayenne Pepper - 0.45 mg.
Inactive Ingredients: Brewers yeast, citric acid, coconut oil, glycerin, mixed tocopherols, molasses, rosemary extract, tapioca, starch, tapioca syrup. Ultra Oil for Pets - Skin & Coat Supplement with Hempseed Oil - 8 oz. 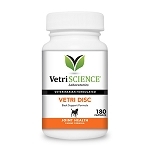 VetriScience Vetri-Disc Back Support for Dogs - 180 ct.